Lacto-fermented vegetables add a pleasant and sour crunch when cooking in the kitchen. 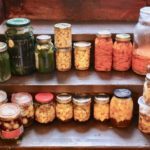 Foods that undergo lacto-fermentation are full of healthful probiotics and enjoy an extend shelf life. Once your vegetables are peeled and sliced add them to a mason jar so they are 1 inch from the top. Optional: add any additional flavourings such as pickling spices or fresh herbs like dill. Continue this process for 3-4 weeks until lacto-fermentation bubbles no longer form. Move the jar to your fridge once lacto-fermentation has completed and enjoy for the next 3-6 months.